Givry is a small village in the Côte Chalonnaise region of Burgundy. 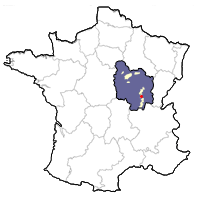 It lies about ten kilometers west of Chalon-sur-Saône and has about 3,600 inhabitants. The village dates back to Gallo-Roman times and the name comes from the Gaulish word gabros, meaning goat. Between the 13th and 18th centuries, Givry was surrounded by a wall eight feet thick, with eight towers, four gates and a moat. During the 18th century, the fortifications were leveled and subsequently used as building materials elsewhere. The city hall was built in 1771, the Fontaine aux Dauphins in 1776, and the church in 1791. A small remnant of the 13th century wall can be seen next to the city hall. In the town center is the Halle Ronde, a circular corn market built between 1825 and 1830. Towards the end of the 19th century the Halle Ronde fell out of use. Today it is used for exhibitions and wine tastings. Givry was the favorite wine of the French King Henri IV (1553-1610). Although it does not command the same reputation as it used to, Givry's red wines are often viewed by some as the best from the Côte Chalonnaise. Because of their location outside the Côte d'Or, they also tend to offer excellent price/quality rapport. The appellation was created in 1946 and now covers about 300 hectares (740 acres) that produces about 1.4 million bottles. Pinot Noir is the dominant grape, although about 15% of the wine is white, made solely with Chardonnay. The vines grow in a variety of soils, including sandstone and clay with Jurassic limestone. The best vineyards face south, and are located just west of the village. The altitude varies from 150 to 300 meters. The climate around Givry is continental, with long, warm summers and relatively dry fall months. Although the area is supposedly warmer than more northerly communes, the appellation's slightly increased altitude helps to moderate the temperatures, something that allows the wines to retain a certain freshness and, in comparison with Mercurey, come across as being a bit more feminine and approachable when young. Premier Cru?Givry's 30 Premier Cru vineyards account for some 40% of the appellation, a percentage some connoisseurs feel is too high and might not be fully warranted.